How Can You Equip Your Students to Own Their Education? Students today are facing what we call an “Aspirations Gap.” This is the difference between what students aspire to achieve and what they actually accomplish. While the vast majority of students today aspire to go on to college, few know what it takes to optimize their potential and reach their goals. 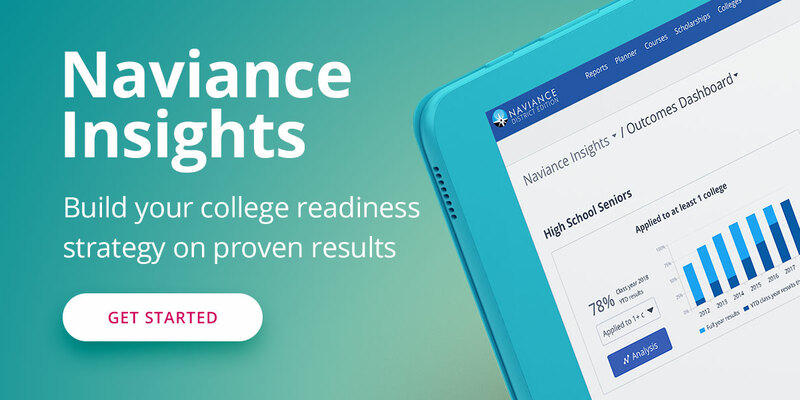 That’s why we created the Naviance College and Career Readiness Curriculum, a blended learning experience for students in grades 6-12 that helps develop critical non-cognitive skills and college knowledge. College and career readiness research, including from the University of Chicago and Dr. David Conley’s organization, EPIC, has shown that developing key non-cognitive skills and college knowledge are critical for students to reach their goals. And yet schools often find it difficult to support students in these specific areas. The Naviance Curriculum is designed to provide every student with this information and ensure that each student is equipped to reach his or her aspirations. In a recent webinar, Curriculum author Kim Oppelt and Product Manager Upendra Jejjala dive into the problems facing today's schools and students, including the aspirations gap. They also preview the Naviance Curriculum lessons, recommend various types of classroom implementations, and highlight the results of a pilot program conducted with 6 schools over the previous year. For an overview of the information session, view the presentation slides embedded below. To view the entire webinar, click here.